Finally, after working on the archive project for at least 11 years, I felt hugely proud and immensely thrilled to see the doors open for business at the Nucleus archive in Wick, Caithness. 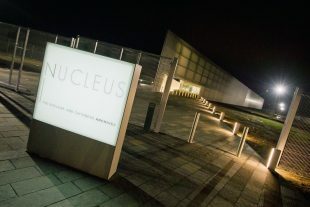 Nucleus allows us to bring together valuable records from all over the UK in one safe, secure location. It will ensure these records are managed expertly and preserved into the future as more and more sites, like Dounreay, reach the end of decommissioning and begin to close down. Pictured with turf-cutting spade. 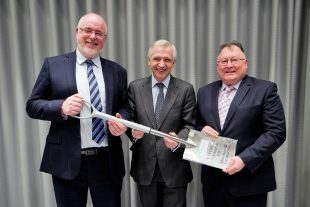 L-R: Rob Higgins, NDA Business Services Director; Stephen Henwood CBE, NDA Chairman; David Flear, Chairman of the Dounreay Site Stakeholder Group. Our decision to locate it in Wick, near Dounreay, was a response to local stakeholders who approached us years ago, when they first heard we were considering an archive. We were happy to respond – it enabled us to honour our responsibilities to help offset the inevitable economic impact of decommissioning sites that were once major regional employers. It’s hard to believe that it’s just over a year since we held the turf-cutting event on an empty construction site, using a shiny new ceremonial spade. 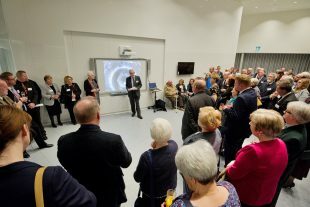 We asked Dounreay Stakeholder Group Chairman David Flear to perform the ceremony because he’d helped broker the original partnership with Highland Council that brought Nucleus to Wick and ensured a long-term home for the important Caithness Archive collection. I was pleased to greet the many local stakeholders who joined us for a get-together the evening before the opening. Stephen Henwood and others reflected on its importance for the UK nuclear industry and for the region, who have hosted the country’s only fast breeder reactors and whose historic public records are also housed in Nucleus under an agreement with Highland Council. We hope to see many of them again when we hold an official opening ceremony later in the year! Records management, like all the other work across our estate, is subject to regulation and scrutiny. As owner of all the information in our estate, we have a responsibility to ensure it is preserved and made available in line with the obligations placed on us on behalf of government. ‘Information’ covers a wide range of material, ranging from archived operational records and plant designs to graphics, photographs, publications, digital records, patents, research documents, workforce expertise.